One of the best lots in the Butte Meadows community! Cozy cabin situated on 1.45 acres...right on the year round creek! This well cared for cabin offers a spacious living room w/ceiling fan, free standing wood stove, wall of windows drawing the outside in & opens up to the full kitchen complete w/gas cookstove, eating bar & cabinets for storage. There is a bedroom w/walk-in closet/laundry area & bathroom w/step-in shower in the main cabin. There are 2 separate bunkhouses/dry cabins offering extra sleeping spaces; one includes wood beam ceiling, ceiling fan & wood stove for those cold winter nights. 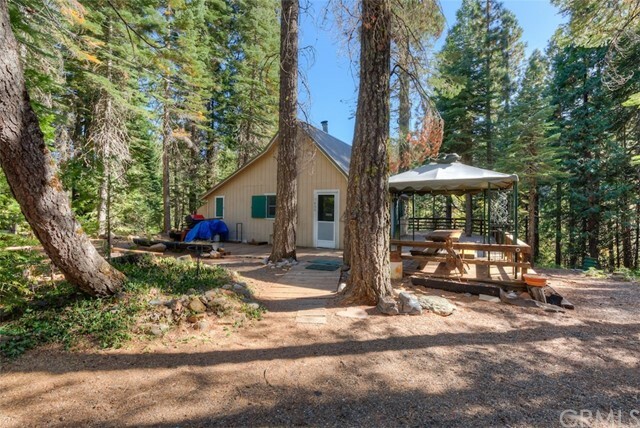 Additionally, the main cabin offers knotty pine ceilings & on-demand water heater. This community includes lots of trails to hike/bike/ride, creek to fish in, large maintained snowmobile park & so much more! There is plenty of room for all your toys on this large parcel which also includes a roomy tool shed & well house. Approximately 30 minutes from Chico but you'll feel like you've gone to a whole other world! Sellers Are Willing To Leave Most Furniture & Kitchen Ware, Please Ask If Interested.